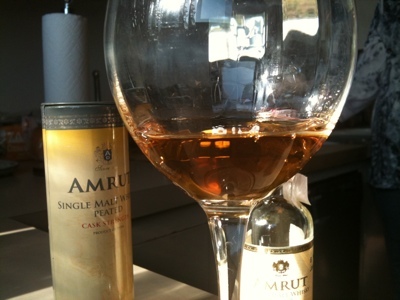 Amrut Cask Strength Peated is a volcanic hot mess of fierce heat, tropic sweet, and reeky peat. Nose: iodine, putty, seaweed, salt air and solvent clashes with bitter citrus, vanilla sweetness, and rich damp loam. It's rich and sweet at the same time it's industrial and maritime. This is an unfamiliar combination and it's both off-putting (at least initially), but also fascinating; growing on me more and more with each glass. Entry is honeyed rich with toffee. But phenol and peat reek kick in at the turn to the mid-palate and explode with spicy heat and tangy citrus bite. As the mid-palate expands burning earthy peat, redolent of soil joins the lush sweetness and evolves into dense tar and ash. 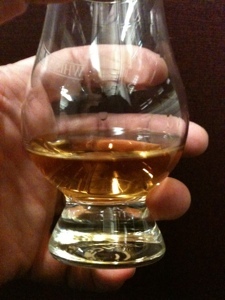 As this fades into the finish astringency develops, merging with the ashy bitterness of the peat. It's like richly honeyed lemon tea hovering above burning earth with road tar, cigar ash, and complicated tropical herbs and spices. At the end oak and peat combine into a burnt sandalwood perfumed bittersweet complexity. My first reaction was close to revulsion. The rich and fruity sweetness combined in an unfamiliar way with the fierce intensity of the peat and I found the combination odd and unpleasant. However, sip after sip as I worked my way into the glass it gradually won me over. The complexity and richness are nothing to be afraid of. 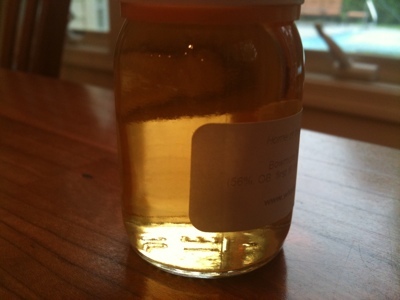 The sweetness - the honey combine with the rich wood tannins into tea flavors. The earthy peat into tar, smoke and ash in much the way of peated Scotches (yet this combination of rich tropical sweet and rich peat is unlike any Scotch). The combination is beguiling once you allow yourself to be seduced, like slipping into an initially too hot tub, first pain, then blissful submission. This is a big, fierce dram. It needs extensive air to fully open up. I found close to an hour was necessary. It likes a few drops of water, and can tolerate more than a few drops. The heat is intensified. Spicy mid-palate heat become fierce cayenne level heat - but the sweetness and floral qualities are amplified too and the peat is rendered better integrated into the sweet. I honestly can't tell which I prefer (with water or without). Citrus, earth, floral aromas, harsh industrial peaty garage aromas, seaweed, salt and sea airs, sweet tea, sandalwood incense, on and on different facets unfold and vie for dominance. What a donnybrook! What a wild mess of a dram. People are going to love or hate this one with violent passions. Where will you fall? I don't know, I straddled both sides of the fence, initially hating it and then ending up loving it. What a wild ride! Located in Bangalore, deep in the South of India - a tropical location on the coast of the Indian Ocean, Amrut's location is hot and humid. Maturation is rapid in the tropical heat. More importantly, Armut has upped the quality of their offerings over recent years with phenomenal results, crafting a house style with a flavor signature that is (as reported in Dominic Roskrow's excellent distillery visit piece in Connosr): "rich, dripping in vanilla, citrus, and honey". They have since added a range of expressions that include a range of fascinating wood finishes, peated malts, malts from multiple continents, and various strengths. 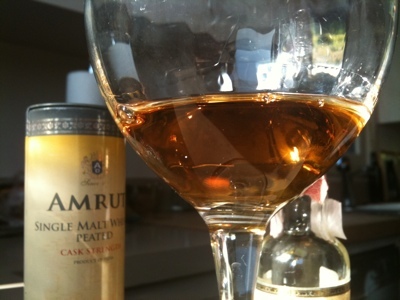 Amrut Single Malt Cask Strength is a cask strength example of the base expression. On a quick visit to my Father, I visited Ledger's Liquors in Berkeley, California. 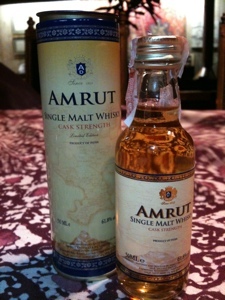 Among their astounding collection of whiskies from all over the world I found some lovely Amrut 50ml miniatures. 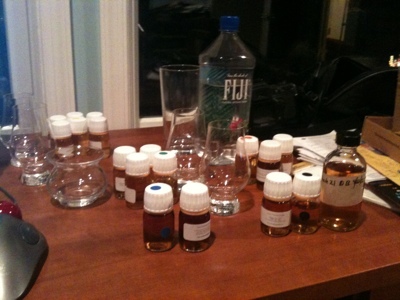 I also had a great conversation about whisky and spirits with Ed. It's the most fantastic liquor store I've seen a while and an unexpected treasure down in the Berkeley flats. Color: Gold with olive tints - almost light amber. A big whisky like this needs extensive air time. I gave a full 30 minutes of airing before beginning the critical tasting as it kept opening up over time. On entry: Wham! A massive and sweet explosion of the Amrut signature flavors of dust, richly honeyed toffee, and overripe banana. There is a subtle but pervasive orange rind aspect, rich freshly sawn oak, and hints of mint at the close of the mid-palate. The finish is long but easy, malty and gentle with oak and caramel. The lingering aftertaste is similar to the distant echoes of having finished a butterscotch sucking candy. 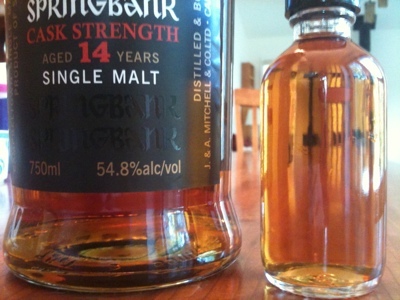 Adding a few drops of water is an obvious thing to do with whisky of this enormous strength and power. The effects on the nose are slight: some mint notes emerge and the banana and toffee loosen, enlarge, and smear a bit. On the tongue, however, the water turns the toffee sugars and bananas into a rich bananas foster experience. Spicy heat is amped up into the explosive cayenne levels at mid-palate. As the sweetness of the opening and the fiery heat of the mid-palate merge there are sweet spices like cloves and nutmeg. The finish remains long and full of gentle herbal bitters and a cleansing astringency from wood tannins. A tour de force of flavor density and richness. 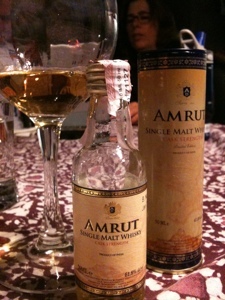 Amrut has achieved a superb balance in the midst of an effusive flavor balance that threatens to go over the top. 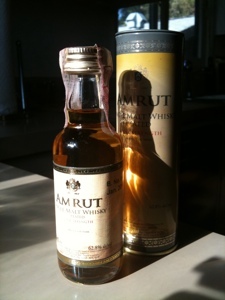 Amrut has rightfully put India among the great whisky producing regions of the world. 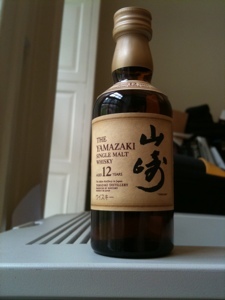 Yamazaki 12 is a another delicious dram from Suntory that surprised and delighted me. 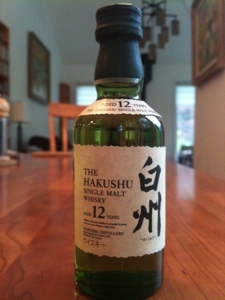 Surprised, particularly because I had a bottle of Yamazaki 12 back in the early 90s that wasn't very impressive. That one suffered from a lack of density of flavor and a very shy nose. Yet from the very first sniff of the current stuff I knew that two decades had been too long a wait to give this one another try. 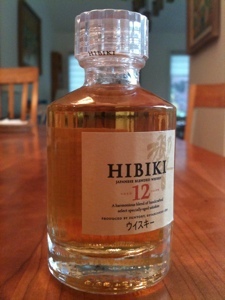 White Oak, and Japanese “Mizunara”– which gives the whisky its complex taste and unique flavor." Color: full gold with a slight amber tint. Entry is sweet with treacle syrup but then immediately spicy. The mouth feel is light but silky. Mid-palate bites with a bit of heat and a lemon-tangerine citrus burst that fades a bit with extended air - replaced by a smooth sweet creaminess. The floral vanilla of the nose arcs over the whole shebang. Then honeyed malt and oak take over at the turn to the finish. 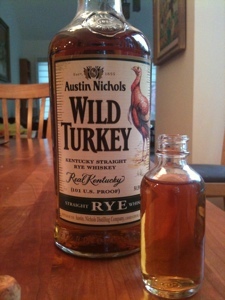 Oak tannins show gently at the finish along with baking dinner rolls and a gentle herbal tang. It's agile and youthful feeling - very sweet. Yet it also has balance, poise, and some complexity. A few drops of water heightens the citrus and almond notes in the nose (banishing the banana). 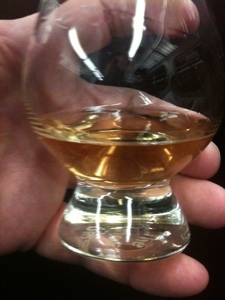 A bit of classic juicy Scotch Highland fruit basket nose emerges (stonefruit, pear, salted butter marzipan). It keeps evolving in the glass and I keep getting more. On the palate a few drops of water ups the sweetness and helps it to carry through the peppery heat of the expansion into the mid-palate which still pops with citrus burst, but more softly. Theres a mellow glow of tropical fruits in the fade of the spicy citrus burst. Bees wax, butter, toffee and malt waft around. The finish is gentle and softly malty-fruity like the aftermath of chewing juicyfruit gum. Given that the nose and entry and mid-palate spice hit are all much bigger than the finish, I'm anxious to try older expressions. I imagine an august presence develops and more wood and flavor in the finish would enhance the balance overall. Still, what's here is glorious. The nose is lovely, complex and involving. 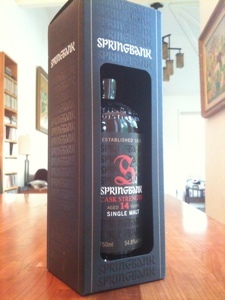 The entry seductive and the mid-palate spicy, rich and sweet. The gentle soothing finish is a salve after the mid-palate heat. Just a lovely and involving whisky overall. What happened in the past 20 years? How did they do it? A sea change. 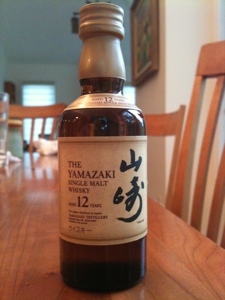 Yamazaki 12 transformed itself from a forgettable 2 star to a vibrant and delectable 4 star treat. I have a complex relationship with Glenfiddich, but I recently had several experiences that helped me understand and appreciate the beauty and iconic nature of Glenfiddich's floral fruity Speyside flavor profile. 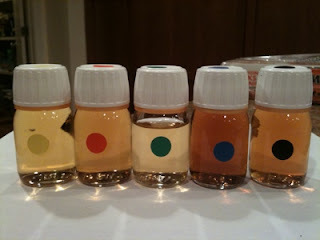 The first was at Whisky Live NY 2012 when Glenfiddich brand ambassador David Allardice poured me a dram of the 15 Solera and very congenially explained the flavor profile to me (and let me take a 50ml sample used in this review). The second, more convincing, happened when I was trying to figure out what the "yellow" whisky was in the Dramming Scotch blind tasting. I detected an aroma that I described as "green pear, green apple, banana, green melon, butter, mineral, honey, honeysuckle". I tasted a number of options including: Ben Nevis 1974/2000 56.4%, Glen Elgin 1975/2011 46.8% and a Dailuaine 39 1971/2010 46.6%. 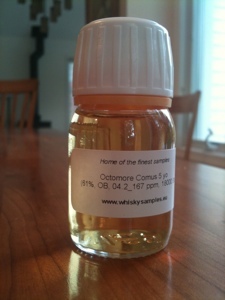 Those are some pretty special and august drams. 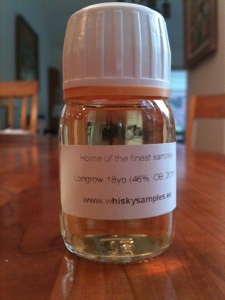 I decided: "This (the yellow sample - which ended up being a 1966 Loch Lomond) is most likely a 35 year old Glen Elgin at 45%. 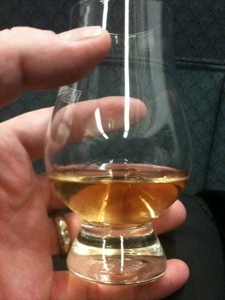 But, wait, the Glen Elgin 1975 in my glass is a bit more honeyed, and a bit less mineral. Mineral - that sounds like Glenfiddich. Vs. Glenfiddich 15 Solera 40%: similar green pear, green apple, honey and honeysuckle and mineral, but more mellow and less phenolic and dynamic. Tasting the Yellow one, the Glenfiddich 15 Solera, the Glen Elgin 1975/2011 Malts of Scotland "Angel's Choice", and the Dailuaine 1971/2010 Perfect Dram head to head is a dizzying experience. They are all so close. Green pear, honeydew melon, butter, honeysuckle and some mineral in each and every one." The Glenfiddich 15 Solera wasn't quite the equal of the Loch Lomond 1966 or the Glen Elgin 1975 - but it was strikingly close. Suddenly I understood that this floral fruit basket flavor profile is a classic old style Highland and Speyside flavor profile of mature august whiskies. 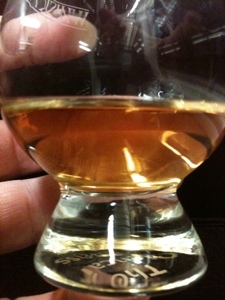 Solera 15 has a mature and august aspect. I wonder how much of this emerges from the Solera method - where a marrying cask is perpetually kept at least half full and new whiskies are added from a series of aging casks. That means that some portion of the cask is very old whisky - some tiny bit going back to the very first whiskies that were ever put in there. You might not want to spring for a 35-40 year old Highland classic for everyday sipping, but you certainly might for Glenfiddich Solera 15, which runs from the $40s to the $50s ($55.99 at Shopper's Vineyard, $39.99 at K&L). 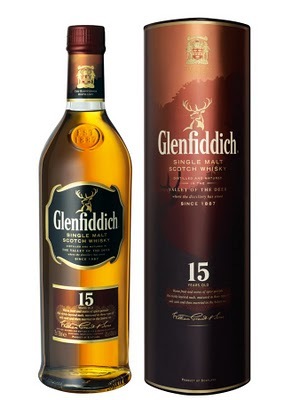 If you love this particular classic flavor profile, Glenfiddich 15 Solera is the most cost effective way to get it. Nose: green pear, honeysuckle or cherry blossom, honeydew melon, chalk mineral, Jucyfruit gum. A wonderfully rich characteristically Spey aroma profile. Entry is rich and sweet after extended air with honeyed fruits and green melon, green pear, sweet butter and a profuse floral filigree. Meadow grass with wildflowers. Mid-palate expansion brings spirit and a light breezy malt and a jazzy medley of juicyfruit flavors. The mouth feel is light and a bit thin - I suspect chill filtering. The turn to the finish is marked by a lovely lean and drying sensation and marked by the hand off from the sweet malt fruity and floral to the mineral and wood end of the spectrum. Finish is medium long with gentle mineral notes, light oak tannins and a hint of oak. You're left with a clean slightly sweet malty fruity glow, as if you had just finished chewing juicyfruit gum. This is leaps and bounds ahead of the Glenfiddich 12 expression for a pretty modest additional outlay of funds. Glenfiddich 15 Solera gets within shouting distance of very high end single malt for a bargain price. 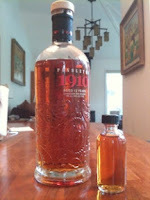 Pendleton 1910 100% Canadian rye - an Oregon Canadian with rich flavor and astounding creaminess. Pendleton is a town in Oregon near Mt. Hood (a massive Cascade range volcano) famous for a rodeo. The rodeo, called The Pendleton Round Up has been held since 1910 - thus the name of this whisky. The bottle is decorated with cowboy motifs like a cowboy boot - with the bucking bronco symbol of the rodeo inside a lariat. 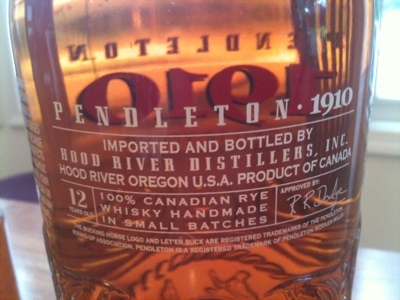 On the Hood River Distillery web site is a press release explaining "Pendleton Whisky is imported, bottled and marketed by Hood River Distillers of Hood River, Ore., and is available nationwide. 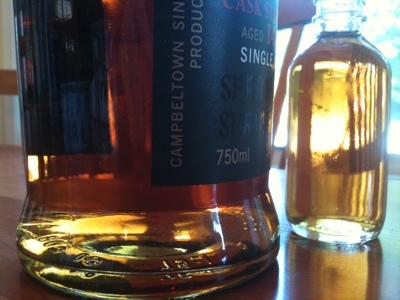 The oak barrel-aged whisky uses glacier-fed spring water from Oregon’s Mt. Hood". Nowhere is there a mention of where the whisky was originally distilled - other than the nation of Canada. It's a bit of a mystery. If anyone knows, please enlighten me. Meanwhile, it's what's in the glass that counts. FYI - I selected this because as I read "Canadian Whisky: The Portable Expert" by Davin de Kergommeaux I felt keenly that in the 3 months this blog has been in operation I have only reviewed one Canadian whisky. I chose this one because Davin's description was so colorful. Color: intense coppery amber. A pure metallic copper color with golden highlights. Stunning! Entry is clean and off-dry with subdued treacle herbal sugars and a kiss of sweet oak. The mouthfeel is rich with silky viscosity. Mid-palate blooms with rye's sweet herbal peppery heat and a lovely creamy sensation. Black pepper, anise, chalk mineral and rich sweet cream dominate the mid-palate and much of the finish with its medium in length and incredibly smooth and gentle. There are whispers of cedars and pines as the sweet cream and herbal pepper fade. At the end there is creamy mouth coating with a hint of cherry malted milk glow. Tannin bite and oak presence are virtually absent at the end. Repeated sips and extended air reinforce the drill. Bold herbal rye in a velvet tuxedo holding a White Russian. The signature of rye is unmistakable, but the smooth creaminess and ultra easy finish is unlike anything I've tasted - even the smooth and creamy Russell's Reserve 6. 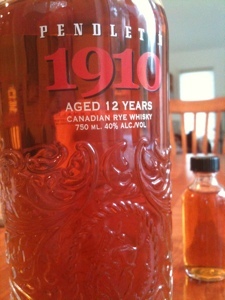 This is unmistakably Canadian whisky, yet more polished and less spirity than most. Delicious. Compulsively drinkable. Perhaps gratuitously I added a drop of water. It amps up the herbal heather in the nose and ups the creamy sweetness into cream soda territory. I like it - but it's unnecessary. It risks taking softness and gentleness into the territory of "flabby". Retails for $39.95. Shopper's Vineyard has it for $31.95. An excellent value at the price. 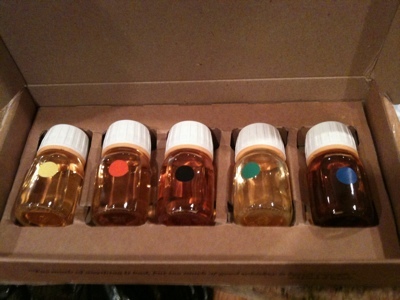 "Here’s a round of single cask Springers matured completely (not finished) in various wine casks for the U.S. market. All four are solid efforts—it’s really a matter of personal preference. (Try to taste them before you buy.) 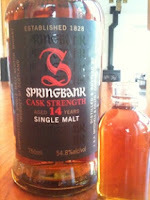 A general comment: most of the single cask releases are matured in some sort of wine or rum cask. While this is nice, I would love to see several single cask, cask strength, and fully-matured ex-bourbon barrel bottlings offered for a change. — John Hansell"
“While this is nice, I would love to see several single cask, cask strength, and fully-matured ex-bourbon barrel bottlings offered for a change.” — John Hansell I’m with you on that one! This got me to thinking: "I wonder if John Hansell and Two-Bit Cowboy are right? Is a bourbon cask expression going to be better than a sherry cask version of essentially the same Springbank?" I looked around and, sure enough, Park Avenue Liquors still had one of the four sherry cask finished versions: the Manzanilla. It looked dark and lush and despite the Blog post's seeming consensus that the paler bourbon aged example might be better I was pretty certain in my bones that the sherry finished one was going to be more succulent and lush. It was a year older, right? It was darker and prettier, right? "Complex citrus (orange, tangerine, lime, and a hint of lemon), honeyed malt kissed by maple syrup, caramelized pineapple, cinnamon, and a dusting of nutmeg. Nutty toffee on the finish." Advanced Malt Advocate magazine rating: 86"
Nose: rich nutty sherry with a slightly tangy acidic note, Like toffee hazelnut dessert wine lemon-lime with dusky oak perfume. 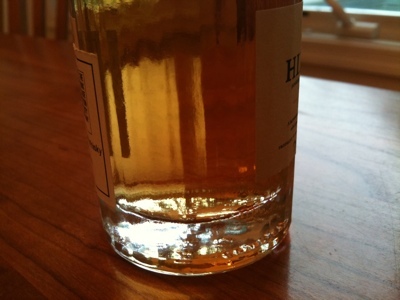 Underneath is a faint salty maritime low-tide note which sits uneasily with the sherry sweet. Entry is dry and elegantly lean. There's a big expansion of dry raisin, spicy heat and a juicy citrus sherry mid-palate bloom. Toffee and nutty brown-wine notes follow. At the turn to the finish is a sour note - lemon or a twist of lemon in balsamic. Maritime airs float around with salt and sea. The finish is medium-short with tannin bite but comparatively little oak flavor. It's richly flavored, yet lean and elegant and distinctive but has some off notes in the nose and the finish. 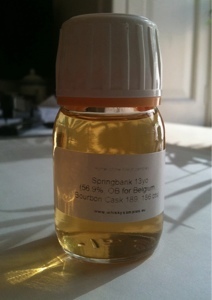 It's vinous in exactly the way Manzanilla would be - but the fit with the eclectic Springbank flavor profile is a bit strained. The sea salt and sour finish clash a bit with the nutty vinous sweetness. More time in the glass and more air make the entry honeyed and lush enough to help carry the finish. Nose: bee's wax and honey. Salted porridge, butter, floral meadow, faint sherry. Further nosing baked sweets with red bean paste deep in behind the honey and sherry vine and salt. It's a rich and lovely nose - redolent of comfort foods and floral beauty. Entry is honeyed and rich with beehive flavors of honey, bee's wax, and oatmeal. Midpalate bites with authority as you'd expect with a cask strength offering. There is august malt sugars and a faint hint of violets. There is also salt air and maritime influence. The turn to the finish brings out a slight dank bitterness like the after taste of drinking beer. The finish is long and lingering with a distinctive mix of honey mead, salty air, sour oak and the lingering flavors of sea air. 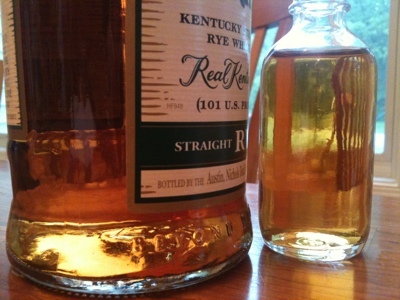 How can the nose, entry and midpalate be so beautiful and the finish so, well, odd? More air helps allay the bitter sour notes. After half an hour or so of nursing I'm getting some lingering sweetness in the finish that help carry the day. The issue is the interplay of salty maritime influences with the lowland fruity honeyed flavors. Conclusion: Both are delicious in their own way - with lovely entries and mid-palates; both are flawed in similar ways: sour notes towards the finish. While this similarity shows the clear kinship of the crafting of the new make, the striking differences in nose and flavor signature show the marked effects of barrel aging. While both clearly have their charms, I ended up going with John and Two-Bit. 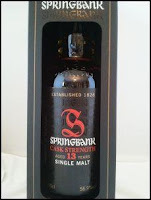 The bourbon aged example was sweeter, richer, more true to the Springbank flavor profile DNA and ultimately the more inviting dram in the end. And bottom line on both: good but not among the really greats from this great distillery. Bowmore Tempest swirls rich sweet fruit and nut flavors with peat and tidal flats bitter tang. I confess that I haven't been a huge fan of Bowmore over the decades. My feeling was that big rich expressions were expensive while the affordable entry models lacked intensity. Bowmores have a distinctive flavor profile that dials down Islay's usual big peat and sea air and dials up a nutty fruity aspect more typical of the Highlands. Bowmore Tempest is a cask strength expression aged in first fill bourbon casks for 10 years and served up without chill filtering or coloring. Batch one was lauded in 2009. 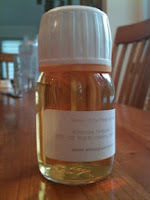 The sample I'm drinking today is from 2010's Batch 2 (a sample from http://whiskysamples.flyingcart.com/). 2011's Batch 3 is the current offering. I've been anxious to try Tempest to see if they really achieved an affordable Bowmore that really nails their flavor profile in big bold strokes. Non-chill filtered no coloring added. Nose: Sweet with toffee, and brazil nuts. 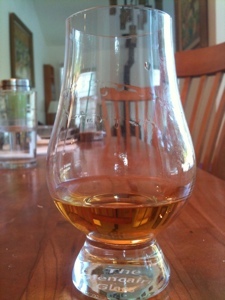 Further nosing reveals almost Speyside-like fruity notes of honeysuckle, pear, and melon. There is spirit heat and some maritime salty airs and warm peaty smoky tinges. In the back there are some mineral notes of gypsum and granite. Complex, big, appetizing. Scrumptious. Entry is huge with honey, toffee candy and then a big spicy expansion of prickly heat, oak, peat, and bitters. The bitters have herbal and also peat (tar and ash) flavor elements. At the finish the bitter fades to oak tannins and salty sea flats at low tide. Nutty, toffee, fruity, spicy, herbal peaty bitter oaky and salty maritime - these wildly divergent flavor elements kaleidoscope across the palate with each sip. Big, powerful, yet sweet and clearly sporting the Bowmore flavor signature DNA. A wee drop of water amps up the honeyed aspect of the entry and raises the bitter of the peaty end of the mid-palate in higher relief. 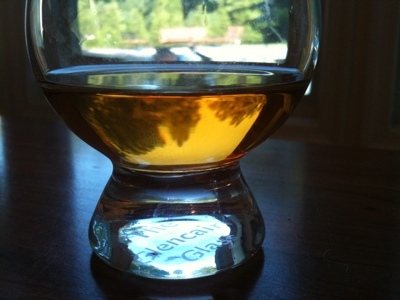 The putty notes of peat become clear in the nose among the nutty sweetness. 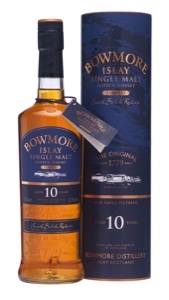 A wonderful richly flavored Bowmore. A sweeter more Highland style of Islay - yet clearly Islay to the core. It was 4 stars until I added a few drops of water. That just tipped it into 5. Succeeded they have. 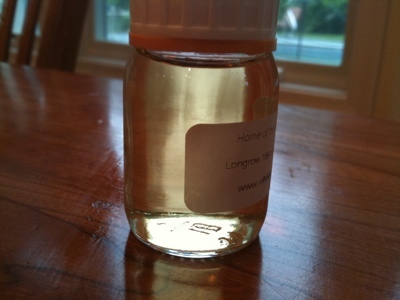 This is a big gutty richly flavored Bowmore that satisfies and then some. Château d'Yquem is the highest end Sauternes, the only Premier Cru Supérieur. 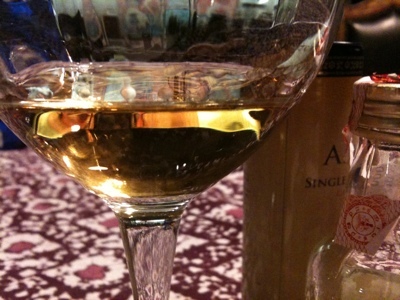 If you like the rich sweet yellow dessert wine Sauternes, you'll want to have it at least once in your life. It is famous for balancing sweetness and acidity with a big tropical fruit and floral nature. In the wine finish craze that has gripped the Scotch whisky world (and, beginning, the bourbon world too now) it was inevitable that Sauternes casks would be used. Probably the most famous such expression is Glenmorangie's excellent Nectar D'Or which amps up Glenmorangie's honeyed floral nature with the honeyed floral nature of Sauternes to produce the laciest most floral expression of Scotch whisky around. Whiskies finished in the casks from the regal and expensive Château d'Yquem are harder to find. A notable example is the kilobuck crystal decanter top of the line Glenmorangie Pride which I had the opportunity to taste at a Glenmorangie flight in 2010 at Keen's hosted by Paul Pacult and Bill Lumsden. 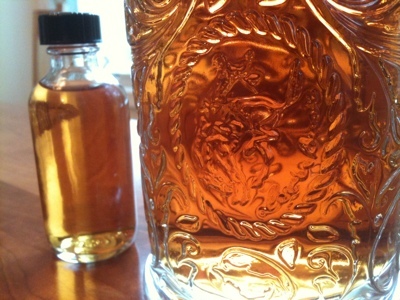 Pride is intensely honeyed and regally floral with tons of figs and dates and honeysuckle flower. Pride is composed mostly of 18 year old Glenmorangie which then rested in Château d'Yquem casks for a full 10 additional years. Glenmorangie is a natural to pair with this delicate wine influence because its high stills, the highest stills in Scotland, emphasize the delicate and floral esters which whisky can possess. FOLLOWING ON FROM THE NOW LEGENDARY OCTOMORE ORPHEUS, THE NOW LEGENDARY JIM MCEWAN HAS CREATED ANOTHER LANDMARK OCTOMORE. COMUS WAS THE SON OF BACHHUS [GOD OF WINE AND REVELLING] AND CIRCE, DAUGHTER OF HELIOS THE SUN GOD AND A SORCERESS WHO WOULD BEGUILE THE INNOCENT INTO DRINKING HER MAGIC POTIONS. "COMUS" WAS A PLAY WRITTEN BY POET JOHN MILTON AND FIRST PERFORMED IN 1634 AT LUDLOW CASTLE, ENGLAND. THE WORK PRESENTS THE DESPERATE BATTLE BY COMUS TO ENSNARE A BEAUTIFUL, INNOCENT GIRL AND THROUGH THE HEDONISTIC POWER OF HIS MAGIC POTIONS ­ - "HIS ORIENT POTIONS IN A CRYSTAL GLASS" - ­ ROB HER OF HER VIRGINITY. A PHILOSOPHICAL DISCOURSE ON THE BATTLE BETWEEN SENSUAL PLEASURE AND PHYSICAL ABANDON, AND REASON AND VIRTUE. 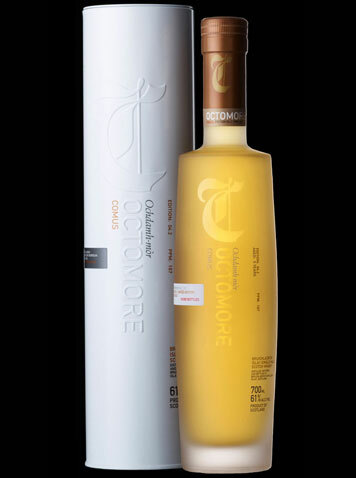 IN THIS OCTOMORE 4.2 "COMUS" WE SEE THIS SAME DUALITY ­ THE INTERPLAY BETWEEN THE BROODING POWER OF THE EXCEPTIONAL OCTOMORE PEAT AND THE SUBLIME ELEGANCE OF CASKS THAT PREVIOUSLY HELD THE WORLD¹S GREATEST SWEET WINE. HENCE THE WHITE, VIRGINAL, INNOCENT PACKAGING - ­ BUT LIKE OUR HEROINE, DO NOT BE DECEIVED... ALL IS NOT WHAT IT SEEMS. 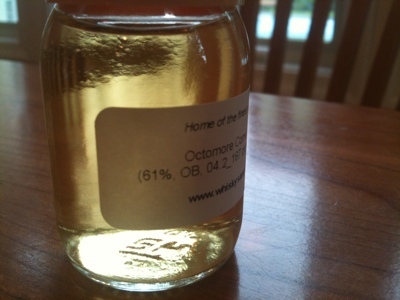 Octomore 4.2 Comus is a lovely light gold color. Color: pale gold - a slightly richer color than the light straw of the non-wine finished Octomores. Entry is sweet and honeyed with a much richer mouth feel than other Octomores in my experience. The flavor signature of Sauternes is immediately apparent as a softening and richening overlay on top of the usual razor sharp sugars of Octomore's opening. This opening is lush, but with a drop of water the sugars explode and the whole fore palate becomes much more richly honeyed yet: viscous, and rich with a Sauternes like sweetness. (The enhancement wrought by the addition of a few drops of water (only) is so profound that I consider it mandatory for this dram.) At mid-palate where the floral aspect of d'Yquem emerges, however, the smoldering peat attack owns everything and overshadows the Yquem flavors. As in all the other Octomores the peat builds huge and smoldering in the mid-palate and turns to ash in the finish; a huge dominating flavor aspect. This is the "Dr. Jeckyll and Mr. Hyde" aspect of Octomores: the ethereal sweetness up front which gives way to a dramatic mid-palate expansion dominated by a huge wall of peat reek. 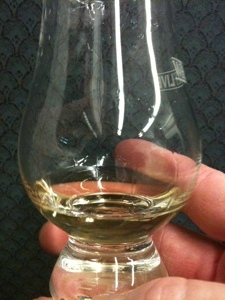 Somehow this transition, which thrilled and delighted me in other Octomore expressions, induced some regret in me here. The Yquem glory up front is eclipsed by the massive peat attack and doesn't show up again until the palate progresses through fiery peat, road tar, and then the long finish of smoldering ash and then lingering herbal notes and a wistful final post echo of sweetness and then finally the decks are cleared for the next sip. Is this new regret a shortcoming of this dram, or is it a testament to the beauty wrought by the lovely Yquem Sauternes finish; a beauty so lovely that I cannot bear to see it so roughly treated by the peat monster's massive shaggy bulk? I don't know - but I pondered this with a knit brow. 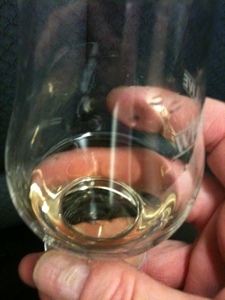 The Sauternes finish has softened the "usual" Octomore initial razor sharp sugar opening and tempered and thickened it. The rich d'Yquem flavor profile luxuriates the intense sugar sting and makes it softer. That's the bottom line here. 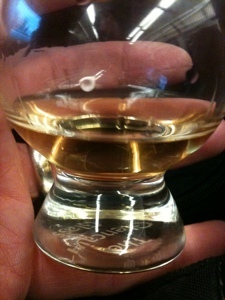 This is a softer, more plush and luxurious Octomore. I don't know if I prefer it to the un-wine-finished style I've tried in the 1.1, 2.1 and 4.1 expressions. It's different and new. If you found the initial intense razor sharp sugar attack of these other Octomore expressions too intense, this 4.2 Comus expression will be a revelation. Personally I'm inclined to find it an incremental improvement. Something is most definitely gained, but something is lost too. Softer and richer isn't unambiguously better in my opinion. However, Octomore remains the most intense flavor profiles I've experienced and 4.2 Comus doesn't disappoint in this regard. 4.2 Comus goes new places and stretches to new extremes. I remain quite bewitched by the whole crazy series.